If you want to see the one fresh economic growth idea that has finally jelled in American society and that cuts across party lines with the potential to create a large middle-class majority, then read on. A new book, THE 3rd WAY: Building “Inclusive Capitalism” through Employee Ownershippresents a major idea that will renew The American Dream and make more wealth available to more citizens by encouraging broad-based employee stock-ownership in small businesses and large corporations. The authors are working with the public relations firm that I work for. In getting to know them and their ideas, I can see how passionate they are in wanting to share their book with the American public. “The central purpose of this book is to make the case that by further enhancing the tax incentives for corporations to share equity with their employees, the nation will see an overall better performance by corporations, a more secure and motivated workforce, countless benefits to society, a stronger economy, and potentially more tax revenue,” says Republican co-author Veny W. Musum. Some 15 million fortunate employees already participate in employee-owned companies, impacting over 10,000 companies with combined assets that exceed one trillion dollars. But this only represents a little over 10% of the workforce. THE 3rd WAY lobbies for a revolution and calls for the greatest economic reform this country has ever undergone. It wants the nation to adopt the ESOP (Employee Stock Ownership Plan) model as the standard way of doing business. The book is authored by a long-standing activist Republican, Musum, who is a New Jersey businessman. He is joined by a respected Democratic leader, Chivukula, the well-liked, brainy, policy-oriented Deputy Speaker of the New Jersey Assembly. The political officeholder capable of across-the-aisle dialogue and policy discussion when it’s designed to benefit the middle class. Both political parties are observing that an economic Hurricane Sandy has slammed into the American middle class in the last few decades. Unlike our parents’ post-World War II generation, the middle class on average is not doing better each year. This book’s solution is to broaden the ownership of private capital without redistribution from the rich to the poor, by creating many more capitalists who can supplement their wage income with some capital ownership and income. The authors’ bipartisan way to accomplish these goals is for government to get out of the way. The key proposal of this book is to restructure tax incentives to expand the opportunity for citizens to own a piece of the rock. The authors offer a straightforward solution and agenda for restructuring the tax state, thus expanding the number of taxpayers while decreasing the rate of taxes. Their solution is to provide tax incentives to increase the chance for middle-class citizens to have ownership opportunities in the small businesses and the large stock market companies where they work, through a variety of methods of moderate risk. Their message: cut taxes and expand private citizen ownership of the economy. They favor removing the barriers to greater support of Employee Stock Ownership Plans (ESOP), which would allow workers to gain shares in the companies where thy work by having worker trusts in successful companies borrow the money to buy the stock without using worker savings. Over the last few decades, closely held businesses and large, publicly traded businesses – have successfully used employee stock ownership plans. The authors propose critical tax incentives for closely held companies and large stock market corporations to set up and fund employee stock ownership plans. They want the tax incentives expanded in both urban and rural Enterprise Zones to reset American policies on poverty to be oriented toward capital ownership rather than just transfer payments. They want to give strong incentives for banks and insurance companies and other financial institutions to loan funds to ESOPs that want to purchase corporate stock. “We can move away from this unending futile debate between capitalism and socialism, between taxing and spending, between individual liberty and the state, between Republicans and Democrats – all of which leads us to the same frustration and failed answers,” say the authors. “Our proposals for this transformation involve a 50% or 100% tax credit for corporations on the value of employer stock contributed to employees’ compensation. In Enterprise Zones where the impact on poverty can be greatest, the tax credit would be 100%, while the tax credit would be 50% in all other areas. As a lifelong Democrat, how can you support a political movement that involves significant tax cuts for corporations? This political movement is not just a handout to corporations but a well-thought out way of including the middle class and poor Americans in the American Dream. The vision to share the American Dream was implemented during Lincoln’s presidency, through the Homestead Act, and subsequently through the employee stock ownership plan legislated by the US Congress. With land ownership, Americans were able to participate in economic prosperity. That earning involved a lot of labor and the earnings proportional to the labor put in. But, as times changed and technology advances were made, the importance of capital grew. Capital ownership made a big difference in the earnings, thereby, leading to income disparity—capital owners were able to earn more rapidly than through their individual labor. While the human labor and its earnings are directly proportional to time spent, the capital-based earnings had no such time limitation. As a Democrat, I am concerned about the growing income inequality and the income divide, especially, among hard-working middle-class Americans. As explained in the book — in the GDP, content of labor decreased from 80+ % during the Homestead Act to around 10%. This is attributable to reducing content of the labor to 10% and increasing content of capital at nearly 90%. The economic gap is caused because capital ownership contributes to rapid wealth creation. One can address the access to wealth creation through increased employee ownership. How did you come to write a book with a Republican, where you both agree on major things in a big way? Many good things have happened when people with different backgrounds, especially differing political backgrounds, have come together. Two well-meaning individuals who care about contributing to the inclusive democracy can come together and share their viewpoints for the betterment of society. I would like to offer solutions as I have done as a NJ legislator. Veny Musum is a very caring individual with clear objectives to solve the economic disparity issue. He is a firm believer that stock ownership is one of the reasons why he is able to care for himself and his family. Together, we would like to offer a solution through employee ownership and at the same time help small family-owned businesses as well as other businesses to share their wealth with their employees. What exactly is THE 3rd WAY advocating for? 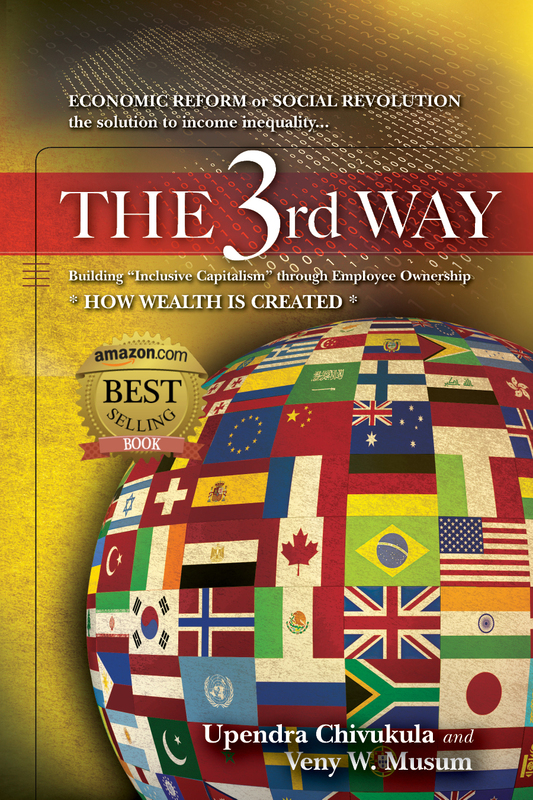 THE 3rd WAY is advocating for inclusive democracy that addresses income inequality and access to the opportunity to succeed in American society. We would like to see employees get ownership in addition to wages, so that they can be part owners of the American prosperity. Traditional approaches to addressing economic disparity have not worked. THE 3rd WAY advocates for the government at all levels to promote and incentivize employee ownership through tax credits, and it advocates for creating economic zones in select urban areas to address high unemployment rates. An employee who has ownership in the company that he or she is working for has a stake in the company’s success and tends to work harder. We need to recreate the hope in the American Dream; we need to empower the American worker with the economic incentives to increase productivity. How do you hope to achieve the aims you outline in the book? The book explains that Communism has failed and “Concentrated” Capitalism works but it is not fair, and that there is a third way to increase wealth creation by engaging all working Americans. I have introduced legislation in the NJ Legislature to incentivize non-public corporations (family-owned businesses, etc.) with under 500 employees to sell the companies to their employees, instead of out-of-state and large corporations. We are advocating for similar laws at the federal level. While advocating employee ownership at various levels of government, we must engage the presidential candidates to talk about income inequality at various levels of government—what role the federal government can play and how quickly. We need to engage the American public with the concept of employee ownership and how they need to engage their elected officials to proactively address it. Nearly 15 million Americans already work for companies that involve an ESOP. What will it take to grow that number significantly? The demographics have been changing. Entrepreneurship among millennials is increasing. New small businesses tend to create more new jobs than multinational corporations. Adequate funding to the states so that employee ownership benefits through tax reductions can be offered at the state level. Also, increasing the funding through the Small Business Administration will help. Even though the concept of employee ownership seems so simple it is not well understood or seems to be difficult to explain. It is imperative to engage the American public in this conversation, and empower the American worker. We do have Urban and Rural Enterprise Zones (UEZs, REZs) offering sales tax incentives. We need to expand the concept in creating Economic Zones both in urban and rural areas, with appropriate tax incentives for business creation and employee ownership. If Congress takes action, what will then be needed to convince and help companies to share some of the wealth? With the right economic incentives, companies should be willing to participate in employee ownership. Additional benefits like increased productivity because of an empowered and motivated worker can lead to prosperity for the company. That could be a motivator for the companies to share their wealth. Why don’t you believe capitalism or socialism can fix the significant issues of income inequality? When you look at the current economic trends, we can easily conclude that income inequality is on the rise in America and in other parts of the world. Middle-class America is a critical part of the great American democracy. As the times have changed, technological advancements have been made. We need to fine tune our capitalistic approach towards employee ownership. No one can deny the fact that the contribution of labor decreased to about 10% when compared to the growth of contribution of capital to nearly 90% in the production of goods. This disparity can be contributed to the importance of capital and ownership of the same. For example, the earnings of the owners of Starbucks when compared to the worker in the coffee plantation, or the coffeemaker in a Starbucks store, tell quite a compelling story. 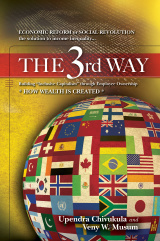 Do any of the political parties or presidential candidates appear ready to embrace THE 3rdWAY? Many of the presidential candidates are talking about the middle class. But, their solutions don’t seem clear. We are working hard to get this concept into both party platforms. On the Democratic side, we are able to include the concept of “inclusive democracy” in the platform. While the Republican candidates talk about tax cuts to corporations, they seem to seldom talk about income inequality and a possible solution being employee ownership. We need to engage both parties in problem-solving and not just pointing fingers at the inadequacy of the other party. While no solution is perfect, Veny and I believe that employee ownership is a strong, viable solution with great potential and significance to the current times. We need political leaders with vision who are willing to take a risk through new innovative approaches. You were born in India and come from a very interesting cultural background. How does your heritage inform your views on what needs to be done to strengthen America? Having grown up in India and succeeding in America, I believe that the real difference for me was the access to the opportunity to succeed. America has taught me that through hard work, you can succeed. It also has taught me that in a global economy, we need to compete, which means we have to strengthen our labor force through not only preparing it with the skill set for the 21stcentury but also, employee ownership. We need to continue the prosperity for a strong middle-class America. America has been one of the most innovative nations in the world. We must continue that tradition by continuing encouragement of entrepreneurship and wealth creation and sharing the wealth through employee ownership. If we can’t get more people to adopt the approach taken in your book, what will eventually happen? In order for democracy to thrive, we need a strong middle class. We continue to see the middle class getting squeezed and the economic disparity continues to increase. Wealth disparities can increase frustration and dissatisfaction towards governments’ inability to help. We must convince people that there is a better way to address this issue. Many people are not looking at the income disparity in-depth to find existing and innovative situations. This requires engagement of people from all walks of life. That’s why, we need to get the public involved through high-profile presidential elections. We need to be proactive. We must act while we have the opportunity to bring about change. As a passionate Republican, how can you support a movement that endorses the movement of wealth from some to others? As one can see from www.THE3rdWAYbook.com, the incredibly powerful, though sadly forgotten words of our Founding Fathers appear on this subject. For example, President Thomas Jefferson, third President of the United States made it a major theme in his writings: “Legislators cannot invent too many devices for subdividing property.”President John Adams pushed broad property access and made the powerful quote, “Property monopolized or in the possession of a few is a curse to mankind. We should preserve not an absolute equality – this is unnecessary, but preserve all from extreme poverty, and all others from extravagant riches.” As a staunch constitutional, conservative Republican, I am supremely confident I am standing on very solid ground. What should be known is President Abraham Lincoln pushed through the Homestead Act that granted free land/property to settlers. What is notwidely known is what his Speaker of the House Galusha A. Grow, “father of the Republican party,” said in his last speech to Congress he stated that in the future, because there were growing limitations on capital in the form of land, the future will be in assisting property ownership viashares of corporations. President Ronald Reagan was the one who championed employee ownership and put most of the original favorable ESOP legislation in place. Most importantly, our proven plan accomplishes its objective via private enterprise and not through any and all failed socialistic, state-driven, state-owned model of redistribution to solve income inequality. He is both highly intelligent and has good common sense. He is a man of utmost integrity. He is a political figure that is involved in politics because of what he can do for othersinstead of what he can do for himself. What are some steps citizens need to take in order to force Congress to take action? Excellent question. Any citizen can instantly become the most powerful person in their Congressional District. Call, write, or best yet, make an appointment to meet with your elected official for the US House and/or Senate. Insist your representative read the book and ask for a written response as to whether they will support the concept. Let them know upfront in a polite and respectful way that you fully intend to pen a letter to both your local and statewide papers and on the Internet concerning the response you received back. Also check our “Action Steps” section in the back of our book to see other specific steps you can take to advance economic Democracy. Any citizen can indeed be a one-man or one-woman army when armed with THE 3rd WAY and a little persistence! If the government provides the necessary tax breaks and incentives for businesses to share some of its profits with the workers who played key roles in creating that wealth, what should employees come to expect from the company they work for? Thanks to the extensive and exceptional work by Professors Blasi and Kruse of Rutgers and Freeman of Harvard we have over 100 years of data amassed regarding the idea of employee empowerment. What is absolutely terrific is the data indicates not only is there a high probability that every important business metric is improved for the business, it also shows that higher wages, dramatically fewer layoffs, and higher worker morale are almost always the case for workers! The great thing about our plan is the government is not picking winners and losers in the “Crony Capitalism” we see today. The synergy of a highly motivated workforce working with management in all cases is a proven success for workers, management and most importantly society. You were struck by Lyme Disease a number of years ago. How did this impact your writing of this book? Though one who lead a totally clean life, I was suddenly and inextricably stricken by at least a dozen serious chronic maladies. They included Lyme; CFS; Thyroiditis; CPN (pneumonia-lesions all over my lungs); eyes all full of blood and unbearable, crushing, paralyzing thoracic spine pain that at its worst often caused me to hyperventilate from the pain and once collapse in the hallway of my home. I was dying. Nevertheless, my indomitable spirit would notlet me give up – I would find a way to overcome this. In time, as a result of this ordeal I came to know the top molecular biologist and metagenomic scientist on earth, Professor Trevor Marshall. I am now a patient advocate for his brilliant and revolutionary “Marshall Protocol” that saved my life and helped thousands of others with serious chronic illnesses worldwide and I continue to regain my health more and more each day. All my life I always sensed there just had to be a better way, an optimal way to organize society that was both fair and productive, allowing us all to live both in harmony and able to seek the rational pursuit of happiness. This was now my life’s goal. Then when I became deathly sick my “opportunity” came as it was ordained writing WAS THE ONLY THING I COULD DO to be a productive citizen. So each day I cared for my wife, who is severely disabled with Alzheimer’s, then dragged myself and sometimes yes, crawled up the stairs to my office and pened the book I was destined to write with Upendra. I put my suffering and troubles aside and instead focused on all the good I could do for others if I could complete our work and bring to the masses a truly better way for us all. Are you proposing something new or merely to grow something that has been around for a while? Both. The idea was first piloted in 1956 by famed economist and investment banker Louis Kelso who developed a succession plan for Peninsula Newspapers, Inc. The co-owners, both in their 80s, were able to sell the company to their employees through a creative financing plan. Then the great leap forward was the passage of The Employee Retirement Income Security Act, 1973. Kelso is introduced to Russell B. Long (D-LA), head of the Senate Finance Committee and “arguably the most powerful member of the Senate” at the time. Long sees merit in the ESOP concept and becomes a supporter, helping introduce language into ERISA that defines ESOPs and preserves their tax-advantaged status. Thus the idea took wing that today results in nearly 15 million workers (more now than in unions) enjoying employee equity. However, the new potential of this proven concept is immense and the common sense, straightforward policies in our book would expand this tremendously successful idea. Are other countries employing the model that you share in your book? Yes! Perhaps the best example is the Mondragon Corporation (MC) in Spain, outlined in our book. Mondragon is a stunningly successful alternative to the traditional capitalist organization of production. At the end of 2013 MC employed 74,061 people in 257 companies and organizations in four areas of activity: finance, industry, retail, and knowledge. In each enterprise, the co-op members (averaging 80–85 percent of all workers per enterprise) collectively own and direct the enterprise. As each enterprise is a constituent of MC as a whole, its members must confer and decide with all other enterprise members about what general rules will govern MC and all its constituent enterprises. In short, MC worker-members collectively choose, hire, and fire the directors, whereas in capitalist enterprises the reverse occurs. One of the co-operatively and democratically adopted rules governing MC limits top-paid worker/members to earning 6.5 times the lowest-paid workers. Nothing more dramatically demonstrates the differences distinguishing this from the capitalist alternative organization of enterprises. (In US corporations, CEOs can expect to be paid 400 times an average worker’s salary—a rate that has increased 20-fold since 1965.) The largest corporation in the Basque region, MC is also one of Spain’s top ten biggest corporations (in terms of sales or employment). Far better than merely surviving since its founding in 1956, MC has grown dramatically. Along the way, it added a co-operative bank, Caja Laboral (holding almost $25bn in deposits in 2010). And MC has expanded internationally, now operating over 77 businesses outside of Spain. How did we get to the point where you say labor and capital have become decupled in the production of goods and services? Simple. Capitalism (anything that increases the productive power of labor) is a fabulous system for creating wealth, because it relies heavily on technological progress to make the efficient delivery of goods and services more productive. The central question is, who owns that capital? Without new, intelligent public policy called for by our Founding Fathers, Lincoln, and in our book, we will continue to barrel headlong into an inescapable form of “Concentrated Capitalism” and severe social unrest. In our book, we show the changing participation of labor workers and capital workers over time. In 1776, we hoped to be an economic democracy for those with initial citizenship, which was thankfully expanded to exclude no one. We then took the first steps into political democracy. Had technology not advanced, Jeffersonian democracy would have, for the most part, produced a fair and equitable society. At that time, if measured by market forces, 95 percent of the input into production (goods and services) were produced by labor and 5 percent by capital, which was mostly land. In 1776 everyone with citizenship had potential economic power because labor was the main source and everyone was born with it. Therefore, economic power was democratically diffused. Then as technological change advanced, capital workers grew at an exponential rate. The inputs of capital workers and labor workers have roughly changed places! Capital workers now produce at least 90 percent of the input to the economy, with only 10 percent coming from labor. In today’s highly industrialized world, wealth has a close connection to both technology and capital formation. Technological power marches on, yet labor can only work so hard for so long. Tragically, for the most part, we have decoupled labor from capital. The masses of labor own no capital and therefore can’t possibly keep up. Herein lays the root cause of the pervasive, precipitous decline in the standard of living for both the middle and lower classes. The blessings of technological advancement caused their ability to keep pace with income via just their labor to be slashed over time. This is why, in this day and age, the poor stay poor and the rich get richer. Why do you propose even deeper tax cuts for businesses in certain inner cities or enterprise zones? This is perhaps the most exciting, powerful element of the book. It will not only dramatically affect the economic reality of UEZ’s, it will also fundamentally impact the social order in these areas. A dramatic step is what’s required! Remember, that rate is only for a business that grants the equivalent amount in equity to their workers. There are so many virtually miraculous ramifications to such an intelligent new public policy. To name a couple, let’s realize investment wealth naturally flows to its most propitious location. Let’s make our distressed inner cities the most desired locations for private investment, instead of the least. Then perhaps the most exciting element to the wise policy we advocate is how it will drive a change in the socioeconomic culture in those areas. What is my benefit package? What employee equity plan(s) do you offer?